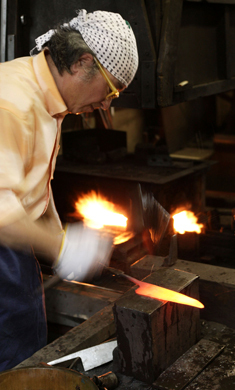 Process (The Making of the Blades) Japanese knife Nigara Forging Co., Ltd.
We pride ourselves with the careful production of each blade, beginning with the selection of materials. We also take custom orders that accommodate our customer’s specific requests. 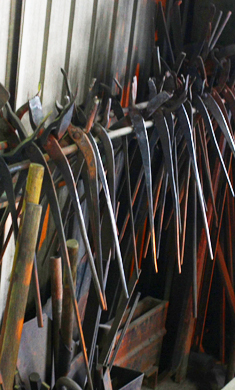 In order to make each blade, the correct size of steel and ferrite must be chosen. 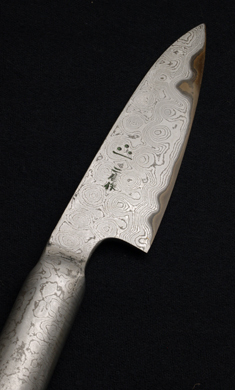 Hard steel with a large amount of carbon is chosen for the cutting edge of the blade. Different types of steel are chosen depending on the intended use of the blade. Ferrite with a carbon count that is so low it is called “ultralow-carbon steel” and “dead soft steel” is chosen. It is joined with the hard and brittle steel above to strengthen the blade. If the blade is too soft it won’t cut well, however if it is too hard it can easily chip or break. By combining the hard steel and the soft ferrite the sharpness improves and the knife is strong against any impact. The steel is joined with the ferrite and heated to 1200℃ in a hearth. They are hammered together into the rough shape of the blade. At this time, powdered forge welding adhesive is sprinkled on top and melted at a high heat. When struck, sparks fly out and iron oxide and other such impurities are removed, improving the quality of the steel. The forge-welded blade is once again put into the hearth, heated, and hammered to the rough shape and thickness of the final blade. The particles on the inside of the metal become further refined, thereby strengthening the blade and making a longer-lasting edge. 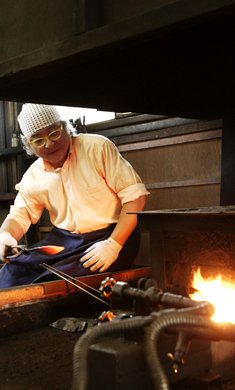 While paying careful attention to the heat of the hearth any iron oxide on the surface of the blade is removed and the surface of the blade is smoothed. 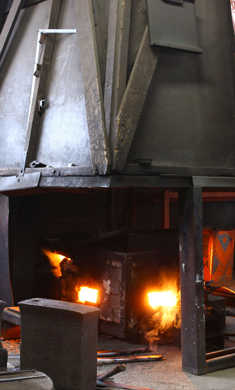 During this process the metal particles are refined even further, improving the durability of the blade. In order to homogenize the structure, the blade is heated at a low temperature and then placed in straw ash to cool. By doing this, any stress and distortions are taken out of the blade and it is further strengthened. A grinder or other cutting machine is used to bring the current shape of the blade to the correct size. Also known as cold forging, the blade is hammered at room temperature or slightly heated and the metal is further refined and the blade is strengthened. Forged blades have dark spots of iron oxide on the surface, if they are left on the blade, the heat will not be evenly spread across it. By polishing the surface and removing black spots the hardenability of the blade is increased. The blade is heated and then quickly put into water or oil to immediately cool it, hardening the blade and improving the longevity of the cutting edge. However, if the blade is heated too much, the steal becomes brittle and the cutting edge worsens, therefore the temperature is strictly controlled. Hardened blades without any further treating are brittle, so they are heated until they reach the correct level of softness. In doing this they become harder to chip and more practical for use. When the blade is hardened the steel shrinks slightly which produces some warpage. The blade is straightened by using a copper mallet to strike the blade and correct its shape. Doing this causes the blade to become easier to use and perfectly straight. A revolving whetstone is used to hone the blade, however the friction caused by the blade rubbing against the whetstone causes heat which can soften the already-hardened blade. Therefore water is continuously poured over the blade and the whetstone while the blade is sharpened. Also during this process, any black spots that appeared during the tempering process are removed. Any cutting marks that are left on the surface of the blade can cause the buildup of unwanted particles or water that causes rust. In order to avoid these unsanitary conditions, sandpaper is used to polish the blade to an almost mirror-like finish. Doing this creates a more rust-resistant and hygienic knife. While constantly making minute adjustments, the blade is affixed to the handle. In order to prevent any water from entering into the insertion point of the handle and causing rust, epoxy resin is inserted and the blade is affixed. Making the blade in this way, being selective about each step of the process, gives us the confidence to say that we created a knife that “doesn’t break, doesn’t bend, and cuts well.” This is a knife that is perfectly suited to our customer. 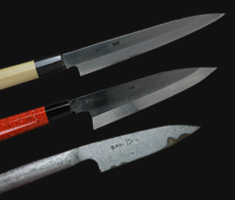 We sells manufactures paper knife or japanese knife with the use of technology such as the Japanese sword handed down from the time of samurai. 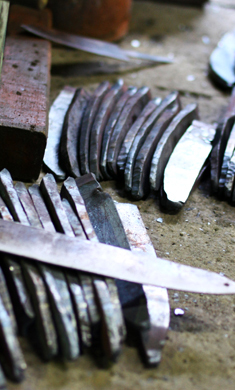 The folding and hammering of soft iron and steel produces a distinctive beauty in each knife we ​​make.